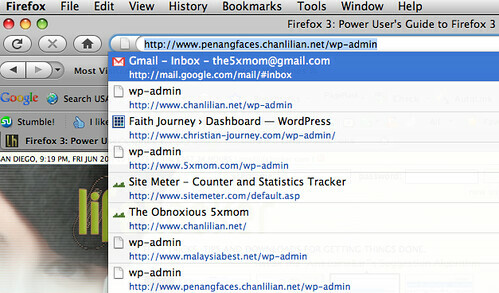 Apparently people are searching for all kind of things related to the new Firefox 3 toolbar. I was just checking out my stats and stumbled upon these useful tips from LifeHacker. First of all, I wonder why the Back Button on Firefox 3 appeared as a huge green arrow on Windows and only a very discreet black/gray on Mac? Secondly, I wonder why when I install Firefox 3, the Back button did not appear on its own? Hmmm… ok, ok, enough of the back button. Now, this is about that annoying Awesome Bar that is nothing awesome. It is like a huge chunk of useless rubbish to me because it shows me the website title and also the URL, taking up a huge space on the Firefox browser. Doh…I am not an idiot who needs those information, dudes. Just give me the URL, not the website name. However, I am an idiot on how to revert back to the previous Firefox 2 more discreet and less of an eyesore. Lucky I found it through LifeHacker’s tip that there is an extension where we make the not-awesome bar back to the old one. There. So much neater and I can have more URLs there too. You can read more useful tips on Firefox 3 from Lifehacker. And if you wish to get the OldBar download for Firefox 3, you can find it here. Pheww….I have so much to learn now that I am using Mac. New commands, new options, new everything. Now, I wish I have enough moolah to get a MacBook Air. I went to check it out yesterday and it is sooooo sleek. But with the amount of money, I can buy two super-duper laptops running Windows. Never mind, let me go and dream of hitting the jackpot with some new make money online oasis and who knows, my dream of the MacBook Air may come true. If wanna do disable the Awesome Bar completely also can. That awesome bar is really annoying. Wow, that seems like a completely unnecessary feature. I’m glad I held off on downloading until everyone’s figured out how to fix things like this! The idea behind including the page name and URL is that you can now search for pages you’ve visited based on the page title and not just solely on the URL. E.g. you remember the subject of an article on some random blog you’ve read previously but can’t remember the blog URL so you just type in “death metal puppy” and voilÃ¡, there it is. how do you get rid of that completely. i do not need the bookmarks to show there if i wanted them i know where they are. it is annoying. how how… someone tell me please!!!!!!!!!!!! !